Ibrahim Shoumenn recently celebrated his 15th birthday in Jerusalem, a three-hour bus-ride from his native home in Amman, Jordan. As he blew out his candles, he wished not for the new smartphone he loves, but for his eye sight to return. Ibrahim, who suffers from Norrie disease, a recessive genetic disorder which causes blindness, underwent surgery at the Hadassah Medical Center in an attempt to restore the small amount of vision he had before he lost it altogether. Totally blind in one eye, Ibrahim previously had a little vision in the other when his parents first bought him to Hadassah at 10 months of age. Although there was no treatment for their son’s condition, Hadassah’s physicians told them to bring him back if his remaining vision worsened. When Ibrahim woke up completely blind this past January, his parents knew it was time to return to Hadassah. His aunt emailed the medical files to the hospital and Hadassah readily agreed to accept him as a patient. Hadassah’s Pediatric Ophthalmologist Dr. Hadas Mechoulam operated on Ibrahim and relates that the surgery successfully restored some of Ibrahim’s vision to him. Ibrahim’s parents are passionate about the excellent treatment their son received from the doctors, nurses, and other medical staff at Hadassah. “Everyone has just been so nice!” Ibrahim says. Ibrahim’s mother, Dalal, a tall and elegant homemaker, notes that her son learned English from YouTube videos. “He has such a musical ear,” she relates. His father, Shoupash, an engineer for Mercedes, streams a video of Ibrahim playing the accordion on his phone. 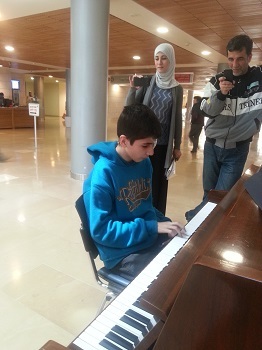 Realizing the hospital had a piano, Ibrahim went over to play it, letting the music flow through him. Passersby stopped to enjoy the offering. “This is the first time he’s played a piano. He usually plays his accordion,” his parents explain.